Asking how risky, or how lucrative, ETFs are is like trying to judge a soup knowing nothing about the soup itself, only that it is served in a blue china bowl. The bowl — or the ETF — doesn’t create the risk; what’s inside it does. Thus stock and real estate ETFs tend to be more volatile than bond ETFs. Short-term bond ETFs are less volatile than long-term bond ETFs. Small-stock ETFs are more volatile than large-stock ETFs. International ETFs often see more volatility than U.S. ETFs. And international “emerging-market” ETFs see more volatility than international developed-nation ETFs. 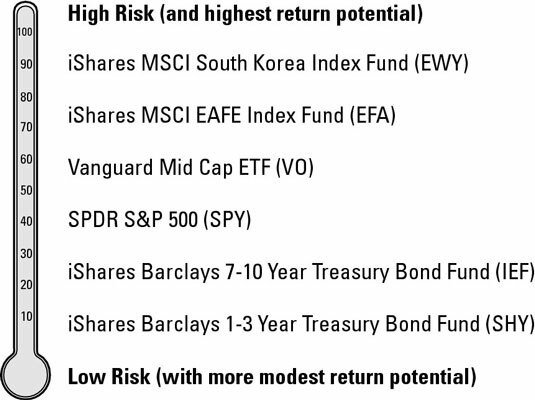 Note that various ETFs and where they fit on the risk-return continuum starts with bond ETFs at the bottom (maximum safety, minimum volatility) and nearer the top features the EAFE (Europe, Australia, Far East) Index and the South Korea Index Fund. An investment in South Korean stocks involves not only all the normal risks of business but also includes currency risk, as well as the risk that some deranged North Korean dictator may decide he wants to pick a fight. Keep in mind that segregating these ETFs — treating them as stand-alone assets — is for illustration purposes only. Stand-alone risk measurements are of limited value. The true risk of adding any particular ETF to your portfolio depends on what is already in the portfolio.